Pokémon Go, the wildly popular mobile game, brought augmented reality technology to the masses. Now, augmented reality (AR) is knocking on the door of enterprise IT. Despite its market presence, AR has a ways to go before it reaches the level of success in the business world as it has in consumers. Organizations must figure out the best uses, and questions linger around cost, return on investment (ROI) and user acceptance. 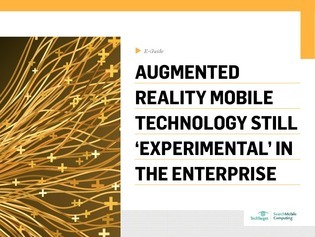 In this exclusive guide, our experts illustrate the basics of AR in the mobile enterprise, and how to overcome AR adoption roadblocks, such as cost, lack of development tools, and more. Read on to dive into the state of the AR market and evaluate its adoption readiness in your enterprise. Intel Inside®. Amazing Cloud Experiences Outside.